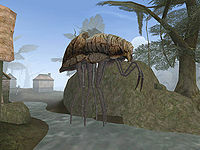 Silt Striders are used primarily as a means of civilian transport in an elaborate network stretching between various cities on the island of Vvardenfell in Morrowind. Having no natural cavities in which passengers may safely repose, a compartment is hollowed from the creature's chitinous shell, wherein both passengers and their luggage are loaded. The Silt Strider itself is then moved by direct manipulation of exposed organs and tissues by its driver, commonly known as a caravaner. Apart from the transportation of passengers, Silt Striders are also employed in the shipment of trade goods. To that end, certain cities—most notably Gnisis and Molag Mar—have constructed Silt Strider docks to aid in the loading and unloading of cargo. Desiccated remains of Silt Striders can be found in various parts of the Ashlands. Most commonly employed in the southern and western parts of Vvardenfell, Silt Striders travel inland in the Ascadian Isles, West Gash, and Ashlands regions. Dependent upon the desired destination, passage to the following cities may be obtained for a set price from the point of origin. Each Silt Strider has a driver, or caravaner, that navigates the Silt Strider to its destination. All caravaners in Morrowind are Dunmer. Caravaners are often good first resources of information about their cities as well. Be sure you explore all topics of conversation with them. Additionally, increasing their disposition towards you will reduce travel costs from their station to others. You can bribe them for a guaranteed disposition increase, but this partially offsets the gains of lower fares. This page was last modified on 21 September 2018, at 18:34.